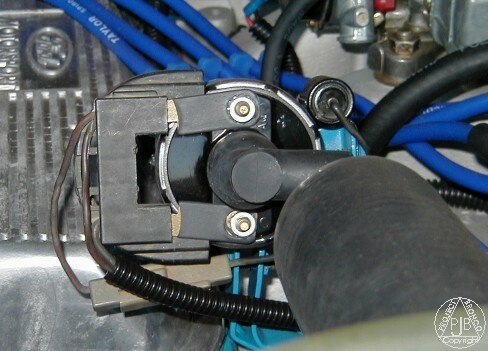 If you have already read through the About My Bronco page on this site, then you may recall that one of the things I want to try on the Megalodon is full-blown Jacobs Electronics Ignition System. However, with a hefty price tag of $380.00, I had to settle for a more "reasonable" ignition system for my new engine until I can afford the full Jacobs system. Since it did not make sense to keep my rusty, ancient Ford Motorcraft coil on a brand-new engine, I decided to try one of the new Jacobs Electronics Energy coils with the Ford horse shoe connector. This coil has a patented Variable Magnetic Core design that Jacobs claims will increase the spark intensity as the engine RPM increases. This design will allow you to open up your sparkplug gap 0.007" to allow for a better spark kernel. The coil only costs $35.00 and it has a lifetime warranty, so I figured, "what do I have to loose?". Normally on a project like this I would include a "Paul's Product Score" rating along with this article. However, I have a problem with this coil. Also, I installed this coil on a new engine that I have never driven with the old coil, so I can't tell if it really made any difference. The problem I have with the coil is the cheesy brass adapters Jacobs put on this coil to make it fit the Ford horseshoe connector. Don't get me wrong, the coil did fit and I did not have to cut or modify my coil wires, but the horseshoe connector sticks out about 1 1/2" from the coil (See Figure 1 below) and will not seat on the coil like it should. I guess I'm just too much of a perfectionist, but I still believe that a quality aftermarket product should fit like original equipment parts, especially when the product is marketed for a specific type of vehicle. 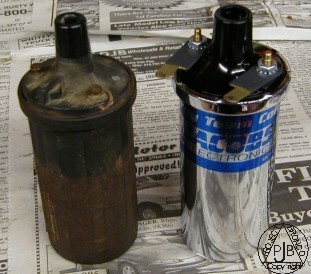 Basically this coil is a standard Chevrolet/Ford type coil with nothing more than a $6.00 pair of brass adapters on it. Be-that-as-it-may, this is not the main reason I'm dissatisfied with this coil. What really rattled my cage was the misleading add in the Summit Racing catalog for this coil. If you pickup the July-August Summit catalog and look on page 114 you will find the add I'm talking about. Look closely at the picture. Do you see any brass adapters? I sure don't! As you can see, I thought this coil was designed like the Motorcraft coil and not just standard coil with a cheap adapter on it. If I were to assign a product score to this coil, I would give it a score of 1.5. Apparently, it was Jacobs who was responsible for supplying Summit with the misleading photo in this add. I have recently obtained a copy of the Jacobs catalog and noticed that the same picture in the Summit catalog appears in the the Jacobs catalog. To be perfectly fair, I must say that the coil itself looks to be very well made and it did fit on my engine without having to make any modifications, so technically it does exactly what Jacobs claims it will do.